It was said the actor Michael Caine sent his kids back to England after they were taught in a prominent US high school that World War II started in 1941. The anecdote may not be true, but decades later a new, similar anecdote could be circulated about the chaotic events surrounding the 2009 US DTV Transition. The original transition date of Tuesday, February 17, 2009, was pushed back by Congress to June 12. 420 of the 1780 full power analog TV stations decided to change in advance of the June deadline, making the “seamless US DTV Transition” not exactly seamless. A simple technical process has been politically botched. Articles in major newspapers, magazines and in the blogosphere repeatedly discuss the government’s coupon program for digital converter boxes, as well as the apparent difficulties of individual homeowners to install and operate digital converters. Nobody has paid any attention to the CATV systems, experiencing difficulties with the reception of distant DTV stations with limited output power, under inclement weather conditions. Are the Grade “B” contours of the new DTV stations indeed compatible with the contours of the old analog affiliates? Will the reception of the new DTV stations still be protected against co-channel and adjacent channel interference? Can the system guarantee the reception of the distant DTV channels under inclement weather conditions avoiding the unpleasant “cliff effect”? Should this “real world” testing deliver disappointing results, it is the head-end engineer’s responsibility to analyze the test results and take corrective action. “Blind experimentation”, cut and paste methods may not be the most desirable approach. Projected signal levels in dBmV, not dBm. Listing of possible co-channel and adjacent channel offenders, testing time could be significantly reduced, the probability of curing reception problems greatly increased. The partial DTV Transition of 420 stations did not reduce confusion. When moving to new a DTV channel allocation, particularly from a UHF to VHF channel, the elimination of the 700 to 800 MHz frequency range requires drastic changes in planning new antenna-array configurations and tower upgrades. When a new VHF DTV station operates with limited (10 kW ) effective radiated power, or the DTV station is reassigned from Channel 68 to Channel 15, coupled with the relocation of the transmit antenna of the new DTV station by 22 miles, the request for a reliable and informative DTV Reception Study seems mandatory. A few examples of POST-TRANSITION DTV RECEPTION SOLUTIONS are presented below. Channel 28, WWLP, Springfield, Ma., an analog station operating with 3390 kW radiated power, was given a new assignment, Channel 11, reducing its output power to merely 10 kW. 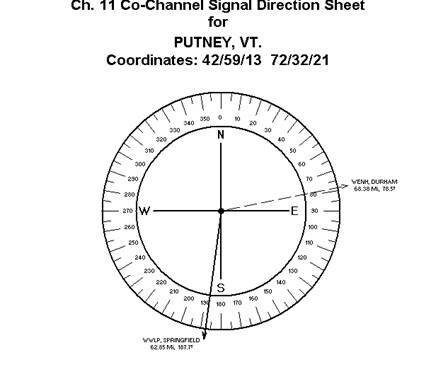 This creates a serious interference situation for the DTV reception facility in Putney, Vt., as demonstrated by the co-channel signal direction sheet below. The new co-channel offender, Channel 11, Durham, receives from almost the same distance of roughtly 60 miles as the desired Channel 11, Springfield, requiring not only a complete receiving antenna replacement, but also the application of an expensive phased array. Nor were DTV reception conditions worked out more favorably for Channel 23, WXXA, Albany, N.Y., reassigned to Channel 7. 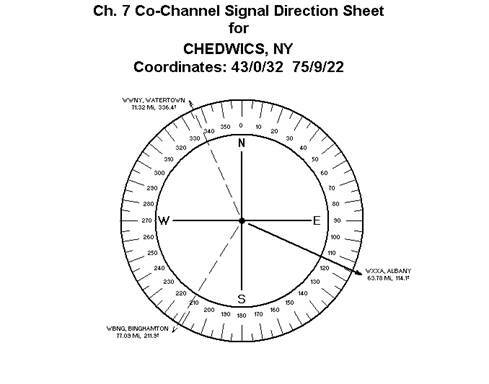 The Signal Direction Sheet below demonstrates the presence of two co-channel offenders, both extremely close (71 and 77 miles) to the Chedwicks, N.Y. receive site. Protection against two co-channel offenders can be a very expensive proposition! 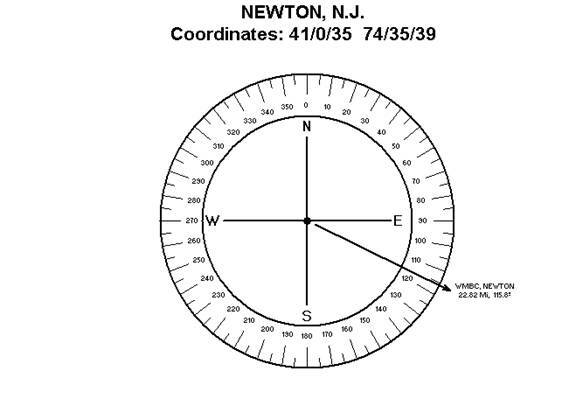 Finally, consider the unique case of Channel 63, WMBC, Newton, N.J. The DTV channel assignment became Channel 18, and the tower was moved to a new location more than 22 miles from the old site. CATV systems, receiving and carrying the WMBC, Newton DTV station, were forced to re-orient their existing UHF antenna-array toward the new location, not a highly desirable task in the middle of winter. Quoting M.J. COPPA, the acting FCC Chairman “this staggered DTV transition is confusing and disruptive”. Who would disagree with Mr. Coppa? Help is on its way. The Biro Computer Runs and Signal Sheets can provide a tremendous assistance to the head-end engineer who is under great pressure to produce fast and positive results. On the other hand, if you are not overly anxious to get the best DTV Reception Study on the market there are other solutions. However these tend to omit important information such as the name of the cities and their distances, or add useless features like Grade “B” contour maps of all expiring analog stations but not the new digitial stations. Accept nothing less than the best DTV signal reception study out there. Contact Biro Engineering immediately.